Carver's 466 Motor Yacht features a surprisingly roomy salon with a very generous bridge, plus all the amenities one would expect of a well designed luxury cruising yacht. Three staterooms and two heads provide comfort and privacy for you and your guests. Carvers’s raised side deck design allows a spacious, full-bean salon, complete with Ultraleather lounges, snack bar, and a fully equipped entertainment centre. All trim and cabinetry finishes are elegant varnished cherry wood. The bridge features a centre-line helm with three swivel seats, and a wrap-around lounge with seating for four. The aft deck is fully enclosed with wing door access to side decks, and the fully equipped wet bar makes entertaining a pleasure. 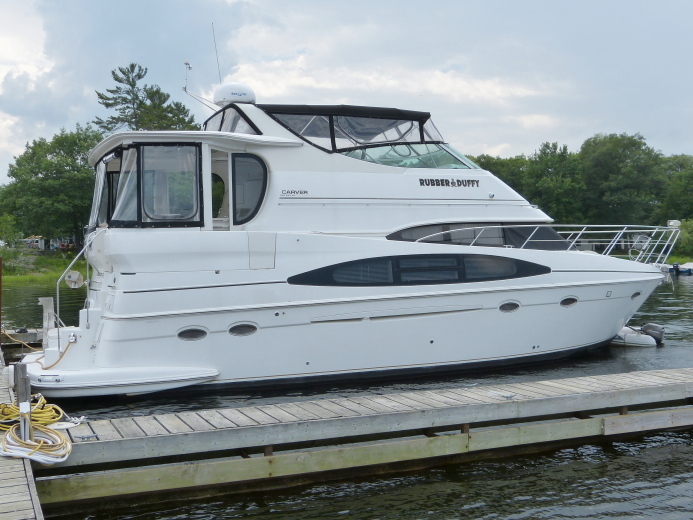 This Carver 466 is equipped with Cummins 450C diesels, bow thruster, full canvas enclosure, and a hydraulic dinghy lift system.